What does doing Jewish mean to you? Does it mean keeping a kosher home, or coming to shul on Shabbat and holidays? Does it mean eating blintzes, pastrami, matzah and other Jewish foods? Or, does it mean simply being a member of an ethnic, cultural or religious group, or having been born into a Jewish family? What does it mean to be a good Jew? A good question, and one I don’t really have an answer to. To say that being a good Jew means being a good person, is overly simplistic. Saying that it means being shomer mitzvot, literally, a keeper of the commandments, eliminates the majority of non-Orthodox Jews, and I want Judaism to be accessible to as many Jews as possible. I want the Malverne Jewish Center to be accessible to as many Jews (and Jewishly curious) as possible. I hope this is what I’ve done during my first year as MJC’s rabbi, and what I hope to continue doing. 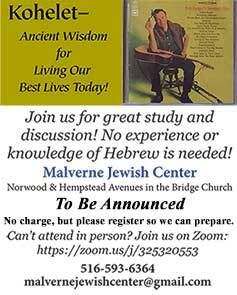 Recently, there have been several articles written, including one in The Jewish Week, pointing out the failure of synagogues and other Jewish institutions to engage Baby Boomers and older Jewish adults. We are a huge resource for the entire community! The attendance at our Life Matters programs suggests that not only are we on the right track in this regard, but perhaps even at the leading edge. While some synagogues focus on attracting young families because the children are our future, in my mind, and I hope in yours as well, the future of MJC begins with us. We grown-ups have a lot to offer each other and the world, and by offering programs and events that offer ways to create meaning and purpose in our lives, we can create a supportive, welcoming and caring community. As I was writing this, I received an email from our July speaker, Rabbi Richard Address, citing a recent Pew study that says, “The American Jewish community, at present, has over 50% of its population over the age of 50. This cohort is bringing interesting changes to our community [and] the spiritual ones, do not get enough attention. Certainly, within our community, this aging cohort is helping re-define American Jewish life [they are] hungry for community, although not necessarily the traditional synagogue community, [they] seem comfortable in experimenting with bringing various interpretations and religious forms into their Jewish experience. Both seem to sense that the electronic/digital age can be a help to them in expanding their Jewish identity and educational quotient.” (http://jewishsacredaging.com/riding-the-age-wave/). In other words, people in our age group want to be engaged Jewishly and with a Jewish community, but not necessarily along the lines of the synagogue models they/we grew up with. In some respects, if I tell you how wonderful an upcoming program will be and why you should be there, I’m preaching to the choir. In this case, thats’ good, because I want you,the choir, to tell me how YOU want to do Jewish, and how I and MJC can be a part of that plan. One way is by signing up for our 9-month Chai Mitzvah program beginning in September. At just $36 for the materials for the whole thing, its a bargain. I’m looking forward to taking that journey as well, choosing areas to deepen my own, ever evolving, connection.